The Daily Post Weekly Photo Challenge, Partners. Legendary New York Time’s Fashion Photographer Bill Cunningham died this week. The Washington Post called him the modern era’s original street style photographer. My own feeble attempt to try and capture someone in action on the streets of New York makes me appreciate how effortless he made his work appear. The other night walking home from the Met on 5th avenue I followed a few couples, all 70 and older in their stylish clothes, 2 of the couples hand in hand making me wonder and curious while filling in the blanks in my mind of how they’ve been able to keep their relationships so strong. Were these second marriages? Was it the obvious wealth they had that freed them from the day to day stress most of my friends and I have in our lives. Was it making sure they took this time every week to be together? Was it that at their age they could stop and really appreciate and enjoy their lives without the care of kids, school and work? I guess if I hadn’t been daydreaming so much I might have grabbed my phone to capture a picture quicker. 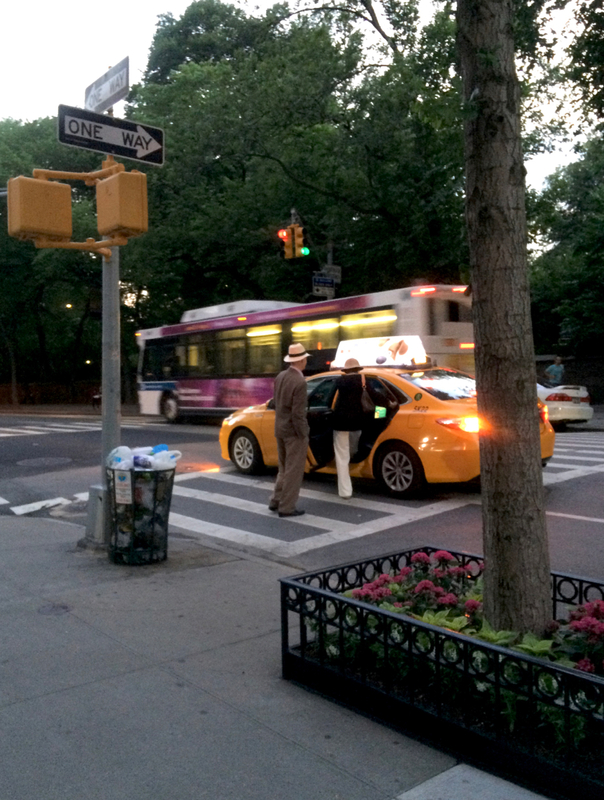 When I decided to turn back the others were gone and these two with their woven hats were already getting into a taxi they had flagged down. § 3 Responses to The Daily Post Weekly Photo Challenge, Partners. Keep the Bill Cunningham flame going! I would really like to think so, but sadly he’s one of the last of a very special time in New York that slowly is disappearing. It’s almost impossible for me to imagine him not riding around the city on his bicycle camera in hand. « The Daily Post Weekly Photo Challenge, Look-Up. You are currently reading The Daily Post Weekly Photo Challenge, Partners. at Women's Footwear in America.